While comedian Bill Cosby continues to languish inside the walls of a Pennsylvania prison, the comedian is receiving unexpected support from the outside. A group of lawyers and individuals who are not party to Cosby’s criminal trials, filed misconduct allegations against Montgomery County, Pa. Judge Steven T. O’Neill and District Attorney Kevin Steele. The complaint, filed with the Disciplinary Board of the Supreme Court of Pennsylvania, accused both O’Neill and Steele of prejudice against Cosby. It is the same body that received a complaint from Cosby’s wife, Camille, in September. The board rejected the new complaint because it noted that its jurisdiction and authority is limited to enforcement of the Pennsylvania Rules of Professional Conduct – a set of minimum ethical standards with which all attorneys must abide. “While the Rules are quite broad in their scope, they simply do not prohibit all conduct by an attorney which might be considered as unprofessional, inappropriate, or unethical,” Alan J. Davis, the disciplinary counsel with the board wrote in his findings. The group which filed the allegations is led by Baton Rouge, La., Attorney Gavin Richard who also participated in an online petition decrying the conduct of O’Neill and Steele. 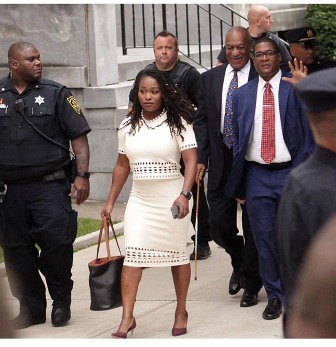 Richard and the group alleged ethical and constitutional violations they said took place as a result of the prosecution of Cosby, who is now serving a three to 10-year prison term after being convicted of aggravated indecent assault. The actions of Steele and his assistants were “prejudiced and overzealous,” the group said. They have previously pointed to numerous actions by O’Neill and Steele, including at least two racially-charged remarks made during jury selection by both of Steele’s assistants and O’Neill’s failure to sanction them for it. Additionally, they’ve noted that O’Neill pushed for a guilty verdict by, among numerous other actions, failing to instruct the jury to properly consider that Cosby’s team appeared to have proven in court that the statute of limitations had expired – making the case an illegal prosecution. They also have noted that when the jury asked for a legal explanation of consent, the judge refused to instruct them. Steele also ran “Willie Horton-Style” campaign ads while seeking the District Attorney’s office against former DA Bruce Castor, who in a sworn-affidavit, said his earlier deal with Cosby should have prevented Steele from using Cosby’s infamous civil deposition as a prosecution tool. In his ads, Steele promised that if elected, he’d “get Cosby,” and once he was elected he allegedly broke the law to ensure the comedian’s prosecution. “It’s an injustice,” Richard said. “Upon a review of the affidavit provided by Castor at minimum, taking what was sworn as true, there remains clear concern,” said Montgomery County Attorney Michael A. Walker, who was not party to either the Cosby case or the Richard filing. “The Law and those protections that we are afforded through our Constitution are there to reach just decisions for each citizen. Irrespective of guilt or innocence, our system of jurisprudence is grounded in the notion of fair play,” Walker said. “Moreover, the law with regard for recusal is pretty settled, to wit if there is a reasonable question of the impartiality of the Judge then he should be disqualified. The law on disqualification goes further, stating that if the judge has a personal bias or prejudice concerning a party with personal knowledge of facts that are in dispute in the proceeding,” he said. Earlier this month, Camille Cosby wrote an op-ed exclusively for the Black Press in which she also decried the treatment of her husband at the hands of O’Neill and Steele. “My husband, Bill Cosby, was recently victimized by a malicious District Attorney and an equally vicious judge,” Camille Cosby said. Cosby, 81, received visits from loved ones over the Veterans’ Day holiday. “He’s fine,” Cosby’s spokesman Andrew Wyatt said earlier this week. The comedian enlisted in the Navy in 1956 and trained as a hospital corpsman and served aboard ships and at the Marine base at Quantico, Virginia, before being sent to Bethesda Naval Hospital. While serving, Cosby was assigned to work with Korean War casualties and he also won awards as a runner on the Navy’s track team. As his service time occurred before his rise to fame, Cosby reportedly also experienced racial discrimination, being forced to eat in the kitchens of the cafes where the team stopped to eat while on the road. He was honorably discharged after four years of service in 1960.